Entertaining Money is Fun Personal Finance! There's no other way to say it. 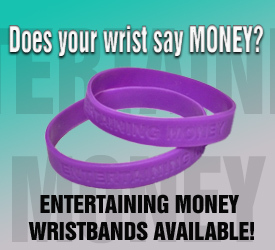 Entertaining Money is definitive personal finance! The Web's No. 1 Source for Financial Education! At Entertaining Money, we are serious about financial education. Our purpose is to help people learn how to grow their wealth in a fun and enjoyable environment. We take great pride in taking the seemingly difficult and making it easy to grasp. By making financial education fun and inviting, we are able to help readers empower themselves and pursue their financial freedom. In addition to an online bookstore, Entertaining Money offers engaging resources that help build the knowledge and skills necessary to maximize personal wealth while minimizing risk. By learning to give attention and consideration to (or manage, in other words) their money, readers develop the ability to truly entertain money!